Dr. Malaisrie and colleagues evaluated data from echocardiograms performed at Northwestern Medicine from January 2005 to December 2013. The researchers identified 265 patients who had severe aortic stenosis and were asymptomatic. 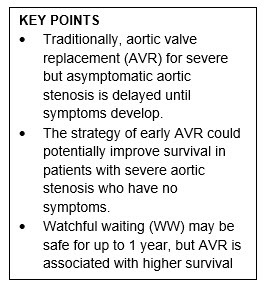 Of these patients, aortic valve replacement (AVR) was recommended in 104 (39 percent), while watchful waiting (WW) was suggested for 161 (61 percent). The researchers found that two years after the recommended approach, survival in the AVR group was 92.5 percent compared to 83.9 percent in the WW group. In addition, the probability of the patients in the WW groups either dying or undergoing surgery was 43.9 percent by two years. While this study demonstrated a “safe” period for WW (for up to one year), the data at two years suggests there is a benefit to early AVR. “If confirmed, these findings would reflect a dramatic potential difference in survival affecting tens of thousands of Americans,” said Todd K. Rosengart, MD, of Baylor College of Medicine in Houston, who was not directly involved with this study. “The results of this study suggest a fundamental change is needed in how we care for patients with narrowing of the aortic valve. “This advance would mirror what we already know and practice in caring for disease of the other major heart valve–the mitral valve–that you don’t need to and probably shouldn’t wait until symptoms develop to correct significant dysfunction of the heart valves,” Dr. Rosengart added. Clinical guidelines from the American Heart Association and the American College of Cardiology recommend “active surveillance” in asymptomatic patients, unless stress testing can expose symptoms. In this study, less than 30 percent of patients were referred for stress testing. Dr. Malaisrie agrees that stress testing can be a key differentiator when considering early surgery for asymptomatic patients and he encourages clinicians to continue utilizing it when determining treatment strategies. The article is “Prognosis of Severe Asymptomatic Aortic Stenosis With and Without Surgery,” by J. Campo, A. Tsoris, J. Kruse, A. Karim, A.C. Andrei, M. Liu, R.O. Bonow, P. McCarthy, and S.C. Malaisrie ( https://www.doi.org/10.1016/j.athoracsur.2019.01.031). It appears in The Annals of Thoracic Surgery, published by Elsevier.